« Fun at work, can it be done? Are you the kind of person when you find a business that you think is great that you share the experience with others? I am, especially if the business has the WOW factor going on and the people who work there excel in the service they give. You can just tell when it is the real thing, they have passion for what they are doing and it just has to come out, you can actually feel it. Such was an experience my family had when we were in Venice in the Spring. As most people we were on a search for the best gelato in Venice. We had spent the better part of the day searching and finding the claimed best gelato stand in one of our travel books. The gelato was good, not great, and the service was just….service. 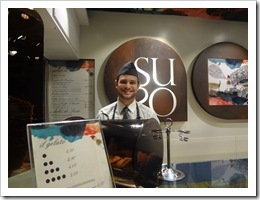 Later that evening when we had walked our dinner off and were heading back toward our apartment, my son and I happened upon this little gelato shop called Suso. There was a young man at the counter as we walked up. He was smiling from ear to ear and offered us a sample. Words cannot describe how wonderful it was, we had found it, the best gelato anywhere! I asked the young man where it was made and he told me that his father makes all of the gelato by hand. Now this was so good that I stepped outside of the store/stand because other family members were arriving and I told them that we had found the best gelato in Italy. They tried it and totally agreed, with me, we were all raving of its creamy, butter goodness. As we raved about it out loud people who were passing by and heard us, went into the shop, before long the shop was so full that you could hardly see Nico behind the counter. But when you did catch a glimpse of him, he was beaming. You could just tell how much he loved what he was doing, and his service was the best. I visited Nico again and asked why they did not franchise this wonderful gelato of his fathers and he told me that if they got too big they could not serve their customers with personal care that only a family, who loves what they create for others could give. He was so proud of his family’s business. They did not want to lose that personal touch and it is that personal touch that people hunger for today, they want the experience. My family has told others about Suso who are going to Venice, we have also written reviews for them. No matter what the business is, a doctor, caterer, dry cleaners, etc., if they WOW you let others know. There is nothing better than when a customer states that they came into a business because someone told them what a great business they were. Word of mouth is the best advertising, help out the great businesses that you visit out by doing some. Keep a handful of their business cards around to give when the opportunity arises. This entry was posted on Monday, January 19th, 2015 at 8:00 am by Tina Del Buono, PMAC. Filed under Business Improvement, Business Owner, Customer Service, Employee Management, Happiness, Leadership, Motivational, Self-improvement. You can follow any responses to this entry through the RSS 2.0 feed. Both comments and pings are currently closed.